Sandra Cisneros is the founder of the Alfredo Cisneros del Moral Foundation, the Elvira Cisneros Award and the Macondo Foundation, all of which work on behalf of creative writers. Recipient of numerous awards including a MacArthur and author of novels: The House on Mango Street and Caramelo, short stories: Woman Hollering Creek, and poetry collections: My Wicked Wicked Ways and Loose Woman, she is currently at work on several writing projects including two books of essays, a book of short stories, a novel and a children's book, Bravo, Bruno, to be published in Italy in 2012. Her forthcoming adult book, Have You Seen Marie? with illustrations by Ester Hernandez, will be published in October 2012. This interview was conducted over the phone by Interview Coordinator Erin Caldwell. She said of the process, "Getting the chance to interview Sandra Cisneros on the phone was kind of like a dream come true. Her book House on Mango Street is taught as a coming-of-age novel in English courses around the U.S., and my ninth-grade English class was one of those classes. Since then, I have followed and admired Ms. Cisneros's writing, sculpture art, and humanitarian work. This interview covers her experiences shaping House on Mango Street, the creation of her politics, and her opinions and advice on artistic creativity and creation. Her warmth and tenderness were apparent through the phone lines and have hopefully translated into print here." Superstition Review: I'm wondering how House on Mango Street came to you, and if you knew that it was the story you wanted to write when you began. 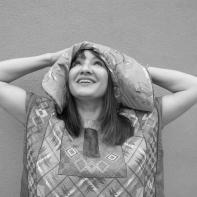 Sandra Cisneros: Well, I started in graduate school, and I was very young. It was my first year of grad school at the University of Iowa, I was about 21 years old when I began it. I was in the poetry workshop, but I was a writer of fiction and poetry. At that time, I had never studied as a fiction writer, and I had more finished poems under my belt than stories. So when I applied, I had do pick one genre, and I guess now I would have picked both, but at that time I was so young I picked poetry, because that's who I had worked with: poets. It turned out to be a good thing that I didn't study fiction; being in poetry allowed me to focus on the syllable, as a unit. But being in the University of Iowa was a big culture shock for me. I grew up in a big city, in a working-class neighborhoods where many languages were spoken. I grew up on a block where you could hear Polish and Lithuanian, you had people from Appalachia on the block, people from Puerto Rico, you had my family from Mexico. You had all these cultures in one neighborhood, and I thought the world was like that. And it is, of course, except in Iowa. I felt out of place as all my insecurities as a person came through, being made to feel unwelcome and uncomfortable. That discomfort is something I always felt as a working-class person in University, especially when I didn't see myself in the literature or the history that's taught. When you don't see yourself in your education, in the books that are taught to you as, say, a woman, or a working-class person, or a person of color, then you feel you don't have a right to tell your story. If you never have studied any stories by women, you'd be very intimidated talking about things that are close to you or stories that you know, wouldn't you? SR: Certainly, and I suppose that where you came into my life, personally, was showing me that you can talk and write about things that, I don't know, Hemingway wouldn't. SC: Right, you wouldn't! Because that's not Hemingway's reality. And if you don't see yourself in a book, you begin to feel that your story isn't valid. And you try to imitate the voices around you, because that's what you do as a young writer. So it was very hard for me, that first semester at Iowa, because I didn't feel my story was valid. I started feeling like I couldn't speak in class, raise my hand, or talk; I became more and more silenced out of my own fears. And when this happens, you're robbed of your voice. So I didn't have a voice. By the time I got to my second semester, I had real doubts about my being a writer, where I belonged. Wondering how I got there, if I should quit. Then there was this moment when I had a breakthrough, when we were talking about houses abandoned during the Russian Revolution. It was a moment of class consciousness. In all the years I had been in higher education, I had never realized what the difference [between my classmates and myself] was: that everyone had or came from a house, and was verified in literature and art. It made a deep impression on me, that one moment in class when I realized that difference. I was aware that I didn't have a house like that of my classmates. And that was the moment I felt like quitting. Out of all the students, I was the only one who didn't have a house, not like the ones we were talking about. It made me want to run away, like some wounded animal, and quit graduate school, and teach high school like I had originally planned. But the good thing about being in that kind of depression, is that you have a point of anger to move from. I was angry that I had never seen a house like mine depicted accurately in film or literature or art, and so I decided to write the book that I had not seen in the library. And that story was House on Mango Street. If I had done what my first instinct was, if I had not persevered, we wouldn't have that book. SR: Wow. How, then, has your writing process evolved since then? Or do you still feed off of those emotions? SC: Well, it was special then. It was from that moment. You know, you start writing from wherever you are, whether it's rage, or depression, or envy, or any evil energy. You start right where you are, and like a meditation, you work towards elimination. So maybe you start angry, jealous, or ashamed, but if you keep at it long enough, it will take you towards the light. And my light, my illumination, is that clarity and duality will take you to your higher self if you keep writing. And that's why a lot of people have writings they don't finish, because they don't rise above these small emotions towards a lighter place. So when I began House on Mango Street and it came from a place of rage, that's not where it ended because I didn't finish it that weekend. I kept writing it and it turned into a positive thing. I finished it through the period when I was teaching high school dropouts and being a college counselor. Most of my time as a formative artist is when I was writing House on Mango Street. In retrospect, what could've been very bad experiences were survived by my using anger to a positive end. It's worth repeating. That I didn't slice off my nose to spite my face, that I did something positive and wrote my way through it. This is my writing process! However, here for the record, I did not write House on Mango Street as part of my thesis. I showed it to my professors, but it was not part of my thesis because I was in the poetry workshop, so I didn't get any credit for it. Writing a fiction piece, though, allowed me to survive Iowa. It was a destructive experience, and writing those pieces helped keep me alive. SR: A lot of those things you experienced, those emotions that you felt in Iowa seems like they have really come out in your work over the years, with class difference and all. SC: I think so. It shaped me, it shaped the organization of Mango, it shaped me politically, my experiences at Iowa, because I realized that that is not what I want. I don't want to write stories that are only read by writers. I did not want more books that were going to exclude the people I love. So it was an important time for creating my politics. SR: Definitely. In regards to politics, gender, and race, all those issues you had to confront, do you feel that those are special challenges faced by Chicano children? That balancing of two separate cultures without belonging in either? SC: I think we don't see our stories. We don't have a public dialogue about our story at all. We're excluded from American History, there's very limited access to us. You don't see yourself portrayed, you don't know your history, and you don't have permission to speak. You can't defend yourself if you don't see yourself. You're not represented in a positive light. I, even as a graduate student, felt silenced, you can imagine how someone who is not educated feels. SR: Do you feel that those issues are still as prominent today? SC: I think it's worse than ever right now. I think, post-9/11, we're living in a state of fear, and when you are in a state of fear you have wrong perceptions, so you can't see things clearly. And I think right now the state of anxiety the United States is in has created a paranoia and a fear about the borders, fear about immigrants, fear about native people, especially in Arizona. SR: I'm sure you feel it in Texas, too. And with what just happened in Tucson, eliminating Mexican history programs in public schools. SC: Exactly. But in an ideal world we shouldn't have to have women's studies or ethnic studies, all of those should be included in American studies. Ideally, they shouldn't have to exist, but since they're not included in American studies, that's why the end up existing in the first place. The people who have eliminated them need to read the books [they have eliminated], first and foremost. I don't think those studies should be limited to just people of those ethnicities. History of Native Americans, history of African Americans, all of those things should be taught as part of American history, as all those histories are how America came to be. SR: Along with those sorts of racial and cultural isolations, though, a lot of your work talks about the unique anxieties that young girls have growing up in our own misogynistic culture, as well as Mexico's. I wonder how you went about deciding how your female characters would cope with these experiences. SC: Well, you have to realize that I was teaching during the years I was writing my stories, and a lot of these characters are based on my students or composites of my students. I can't say that I was ever as wise as Esperanza. She's kind of the spokesperson for me, as I was fumbling through my twenties and making a lot of mistakes as a teenager. Looking back, I find my stories in my students. And so I was writing it and looking for my own feminism. Imagine being a young woman in my twenties, writing and seeing a lot of injustices, hearing the stories of my students, listening to the problems of those high schoolers who would come to me. And I'm an English teacher, what can I do? I could cry. So the only thing I could do was to include them in what I was writing. You know, the book started out as a memoir but ended as a piece of fiction. The reason why is because I felt very powerless as a teacher to change their reality, and one of the only things I could do was to write about them. I think that students don't realize sometimes how deeply they trouble their teachers with their problems. I felt very deeply about my students, and I wanted to do something for them. And you know, I was just making minimum wage, there was very little I could do, and it would keep me up; their situations would keep me up nights. So I was upset, that the only thing I could do was to write my way out of it. SR: Then back with Esperanza, and those young girl anxieties, one of the big things she deals with is the guilt of leaving behind her family and the people she cares about, and then the importance of coming back to them. And many of your female characters in Woman Hollering Creek live in fear of this guilt, or else end up imprisoned by it. I feel that these are important emotions for many young women to anticipate, and confront. How have they translated in your own journey from Chicago Chicana to award-winning author? Did you ever feel those same female guilts about becoming a successful writer? SC: Oh yes. I feel like if you do anything to make yourself happy in society, that it is counter to what society wants from you or is “approved.” If you do anything as a woman to be happy you'll have some guilt because you're probably going to be breaking somebody's law of what they think you should be doing. It's hard, because the laws are never made to please you. They are always imposed on you by faith, or church, or culture. Everyone dictates the way a woman's life should be without asking them, unfortunately. And we don't really know to question that, it's just what we inherit. There is a lot of bumping your head against walls in your twenties. I think that to survive your twenties is one of the most difficult things you can do. But I always tell women: “Don't worry, it'll only last ten years.” (laughs) If you can survive those ten years of trying to be dutiful and please others, and stay intact and get to thirty, then you will finally start being yourself. Then it'll happen again in your fifties. It's like a spiral. You can't just learn it all at one time, you have to go through these stages. There are more than one birth date and death date in your life. And when you're figuring these things out you're kind of between those births and deaths. So, I feel as if for me the twenties were really hard, and the way that I dealt with that darkness and that sadness was through my poetry. SR: Yes, in your stories you do a wonderful job capturing those strange areas between childhood and adolescence, and adolescence and adulthood, like your twenties. You create a tone of permanent transition that I've admired. SC: Thank you! Yes, I feel like that's kind of a magical occurrence, isn't it? The thing about being an artist, though, is that you're always a child. That's a wonderful thing, you always get to play. And that's what being an artist is about: to retain that childlike sense of reality and wonder and play. SR: Do you use any specific tools that help you to capture and maintain those childhood feelings? SC: Writing poetry has been so wonderful for me, and when I'm not writing poetry that's when I get depressed. Writing poetry has been my medication. Writing poetry eliminates the rest of my pain. SR: How often do you write now? Is it a daily event? SC: Well, it depends. I wish I could say I write every day, that I was better about journaling each day, but I'm not. If I'm traveling, I don't write, or if there are people around the house and it's hard for me to get to my quiet place to write. I try when I'm at home. I travel so much, and so it depends on where I travel. Like going to Mexico, always makes me feel like writing. And there are some places, like on a book tour, which is all about meeting people, that scare away the muse. When I put on my shoes and my dress coat, and I have to talk to an audience, I can't write then at all. The more I talk to people, the less I write. And that's true when I'm at home as well. People who aren't artists can't understand the spiritual recovery you have to go through once you get home. They'll say, “Oh, can't you come out! Just for lunch, just one hour!” and they don't realize that a whole day goes into doing just that. I think that what it is, is that artists live so openly, with their hearts so open to everything. And when you go outside, if your heart is open like the aperture of a camera, wide, then a lot of other clutter gets in there. I think when you sleep, and you're in that dream state, you're in a creative space, and so when you wake up that's exactly when you should go to your art. In the quiet, when things in your heart are clear. Think of your heart like a pond: when someone starts talking and you start talking, all the mud in the bottom gets stirred up and you have to start filtering through it. I used to live with my mom, who is completely the opposite. She couldn't understand why I felt this way, thought I was just being difficult. And it wasn't until the end of her life that she understood me, and I could explain it to her. If you don't live with an artist, I think it's hard to understand. SR: Did you grow up speaking Spanish with your family? SC: Yes, only with my father. My mother's first language was English, her second language was Spanish. My father's only language was Spanish, and he only spoke a broken English that he learned as an adult, in the Army...He never spoke it well, so with him I spoke Spanish and then I would turn around and look at my mother and speak in English. SR: How has your Spanish language background played into your creative process? SC: I didn't realize it did. If you had asked me that question in my twenties, I would have said not at all. But now I realize that the way I wrote House on Mango Street, the way the languages work there is very curious. Like if you read a line from House on Mango Streetyou would recognize it as my voice. And that the reason it sounds the way it does is that if you translate it into Spanish, it translates perfectly. The sensibility and the impact, I unconsciously drew from Spanish. SR: Do you feel like anything gets lost in that unconscious translation? SC: No, I think it gains from that. That a new way of writing in English is added. Something beautiful gets added to the English language and literature. I think no matter what, if we draw from what is truly ours and makes us distinctive from anyone on the planet, that's the gift we bring to our existence here. I try to teach this when I teach writing: take the things that make you different from anyone else, even your twin sister, even your family. What do you know that no one else knows, and come to your art from that place and it will be yours. You won't know what's yours until you make a list and see that it's different from anyone else in the classroom. It's what makes you different from anyone in your family, or your city, your neighborhood, your church, your major. Create your art from that place. You'll give the world such a beautiful gift that it's never had before, and that it will never have again without you. It's what I've learned, and I learned it by accident. Writing from anger, and fortunately not publishing from anger. I think it's important to write from those negative emotions but not to publish those negative emotions. To wait until we process them and bring that writing to a place of light. And that's the power of the artist, and the necessity of art is for us to transform that darkness into light. SR: When you wrote Woman Hollering Creek, in your acknowledgements you thank your brother and his wife for giving you a room to write in. I'm wondering, in what ways does your family still support your writing, and in what spaces do you get your most valuable writing from these days? SC: These days, I have a spiritual family, because I don't live in Chicago anymore. And I'm about to leave Texas, I've been living her for 25 years and I'm about to leave for a new home. So I have people who have been like brothers and sisters to me here along the way. Now that I have my own space, they help me by watching my animals while I travel, being very supportive with my foundation work, and volunteering. So I have a lot of people that are like family that do it out of love for me, and I couldn't manage this lifestyle, with all these animals, without their support. I thank these people in my books, and people don't know who they are, but they're my housekeeper, my assistants, my friends, and volunteers. SR: How many animals do you have? SC: I have a circus! I have six dogs, one parrot, and three cats. SR: When did you know that writing was what you wanted to do? SC: Well, I think you always know. You're just too afraid to tell anyone. I knew as a child I wanted to write a book, but I didn't even tell anyone until I was finishing my undergrad degree. I would tell people that I like to write, but that I was going to be an English teacher and then, you know, write on the weekends. SR: Was there a significant event that helped bring writing to the forefront of your life, or was it an organic transition? SC: I think if you're an artist, you're always an artist, and you're kind of born to express it. Even if you never express yourself in art, you have an artistic way of looking at the world. And if you're lucky, you'll have the language to translate that. So for me, I was a visual artist before I was literate. I was still a visual artist after I was literate, as a child, but then I started writing poetry. I always loved the visual arts, and I still do, very much. This year, I was able to do an art installation at the Hispanic Cultural Center in Albuquerque, and so I was able to satisfy that part of me. It's an altar I made, it originally was at the National Museum of Mexican Art in Chicago, it's moved and I hope it ends up in some other museums too. I felt like two parts of myself, the writer and the visual artist got merged in this piece of art, because there is a lot of writing on it and in it. It's an altar to writers and to my mother. SR: When it comes to writing, poetry or fiction, which comes first: the emotion you want the reader to understand, or the action of the story? SC: If I know an action, there's a story. But if there's an emotion with nothing else attached to it, I don't really decide what it is before I write. I sit down and let the writing tell me what it wants to be. If I don't know what I'm writing about, it's generally going to be a poem. (laughs) And if I know some concrete story, or personality, or character, I can usually get a story from it. If some emotion needs language, it's usually a poem. SR: That's fantastic. Is there anything else you wanted to talk about? SC: Well, I'm amused by the banning of books in Arizona. Maybe I'm the only person amused while everyone else is outraged. Because I can tell that from these actions, there has to come a reaction. Even though there is a lot of negative action, there is a lot of positive coming from it. And people who may not have been aware of these books are now suddenly aware of these books. We're living in a time when books, in general, don't get a lot of press, so I think they've done a wonderful thing by bringing books to the forefront. And suddenly people are organizing, and when people organize, it helps to create a positive dialogue that we didn't have before: Are these classes necessary? What do they really teach? What's missing from American History? What are these forces that created these classes? How were they borne from the civil rights movements? Why was the Civil Rights Movement created? I think in the United States, when people talk about race relations, they think about black-white race relations, and now people are seeing the other forms of colonization that have gone on all the while, the history of colonization where the border is concerned, and the history of relations with Mexico. That history has always been denied to citizens, especially in the Southwest. Again, in an ideal world, all these gender and ethnicity studies would just be a part of the regular American studies, and wouldn't be in danger of being repealed. But I think that the opening of dialogue can be a good thing, people will become educated in a good way, and I hope it will take us away into a positive place. I think something we need to ask ourselves, and our readers, is “How can we act as bridges instead of walls at this time?” There are so many communities coming into contact with one another who have no communication, so each one of us has to ask ourselves “How can I act as a bridge? Am I willing to listen? Is the person I'm talking to listening to me? How can I create some more feedback?” If you can change one person, that's a wonderful thing. But we have to remember that the most important person we can change is ourselves. But I'm quoting the Buddha here, so don't give me credit for that!